Hotel Thomas Budapest is in the heart of Budapest, walking distance from St. Francis of Assisi Church and Corvin Plaza. This hotel is within close proximity of Museum of Applied Arts and Semmelweis University. Quench your thirst with your favorite drink at a bar/lounge. Buffet breakfasts are available daily from 6:30 AM to 10:30 AM for a fee. Featured amenities include multilingual staff, luggage storage, and an elevator (lift). This hotel has 2 meeting rooms available for events. Self parking (subject to charges) is available onsite. 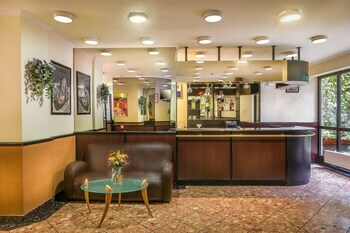 Hotel Thomas Budapest is an ideal Budapest lodging choice for your trip to Hungary. With numerous amenities for guests such as parking - self, lounge/bar, you will wake up at Hotel Thomas Budapest feeling invigorated every day for your time in Budapest. Don’t let this amazing reservation opportunity pass you by, book your stay at Hotel Thomas Budapest today to make the most of your time in Budapest, Hungary.